Jamaica Plain real estate provides residents and business owners with access to the most green space of any Boston neighborhood thanks to the Emerald Necklace park complex. Beautiful old houses adorn this neighborhood, and a long process of gentrification has made the area more and more desirable since the 1990s. This lovely area in the south of Boston offers funky diversity and the oldest community theatre in America (The Footlight Club). Jamaica Plain – known locally as “JP” - has a rich history that has led it to a diverse and dynamic present. The neighborhood houses a strong Latino presence, as well as many young families and a growing gay and lesbian community. The arts thrive here, with theatre, visual arts, and a strong music scene. 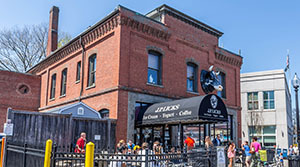 Centre Street is the main shopping district, with the famous City Feed and Supply providing local food to the area, the original J.P. Licks ice cream shop fronted with Holstein cow patterns, and countless other colorful, independent and local shops and restaurants. Outdoor recreation opportunities include the Arnold Arboretum, Jamaica Pond, Forest Hills Cemetery and the Franklin Park Zoo. Contact us to ask questions or schedule a tour, or scroll down to browse properties and homes for sale in Jamaica Plain, MA. Register with us to save your favorite Jamaica Plain real estate listings and get notified when similar properties become available. OPEN HOUSE SATURDAY 4/27 & SUNDAY 4/28 FROM 12:30-2:00 BOTH DAYS. RARE OPPORTUNITY!!!!! TOP COMMUTER Forest Hills Orange Line LOCATION! TASTEFULLY RENOVATED 2 BEDROOM JP CONDO UNDER 400K w/ PARKING (to store your car since you won't need it most of the time) ; ) Enjoy a wide array of restaurants right around the corner. HEAT IS INCLUDED in CONDO FEE! Easy access, PET FRIENDLY upper first floor unit set back from street for privacy. Sensible layout. Sunny kitchen and bath. Tranquil color palette throughout. Beautiful wood floors. Large master bedroom perfect for a king size bed. Incredibly spacious living room with oversized window. Private storage in basement plus common laundry. Electrical has been completely updated. This condo is a joy to be in. You won't want to leave. Listed by Maryanne Resendes, Jamaica Hill Realty, Inc. Welcome to 19 Rosemary. This designer condo boasts many cool and exciting features including multiple skylights, a luxurious bathroom with travertine tile, and a bright white kitchen with quartz countertops and custom cabinetry. This 3rd floor open-concept oasis also features two private porches, in-unit laundry, central A/C, a built in sound system, and blown-in soy insulation throughout. Conveniently located near all of the food, shopping, and recreation that JP has to offer and also close to the bus and train for when you life takes you downtown. Look no further for your next- or first!- home purchase because 19 Rosemary has it all! Turnkey multi-family in the heart of Jamaica Plain. Gut rehab completed in 2015 with lovely finishes. Cook's kitchens with granite countertops, stainless-steel appliances, hardwood floors throughout, recessed lighting, C/A, updated electrical and plumbing, sprinkler system, in-unit laundry, high ceilings with crown moldings, spacious bedrooms, and beautiful natural stone tile bathrooms. Modern open floor plan with private decks and outdoor yard and patio space. Unit 1: duplex with a deck off kitchen and dining area as well as a private patio off master bedroom. Utilities are separate and paid for by the tenants. A wonderful commuter location easy access to Jackson Square and Stony Brook T, as well as South West Corridor Park and bike path, Centre Street shops and restaurants, and Jamaica Pond. Beautiful three-bedroom, two full bathroom condominium in the heart of Jamaica Plain. This unit was thoroughly renovated, down to the studs in 2015 with lovely finishes. Highlights include Cook's kitchen appointed with granite countertops and stainless-steel appliance; lovely stone tile bathrooms; and a wonderful master bedroom with en suite bathroom. Other features entail hardwood floors throughout, recessed lighting, in-unit laundry, C/A, high ceilings, and crown moldings. Modern open floor plan with a private deck off the dining area and kitchen, as well as shared outdoor yard and patio space. Wonderful commuter location close to Jackson Square and Stony Brook T, as well as South West Corridor Park and bike path, Centre Street shops and restaurants, and Jamaica Pond. Amazing one bedroom loft available in the historic Jefferson School House. This is a fabulous sunny one bedroom condominium features soaring vaulted ceilings, new appliances, updated bath, 1 deeded parking space and private deeded storage. This condo is located right in the heart of all that Jamaica Plain has to offer and is only steps to the Green E Line, one block to the 39 bus, a quick walk or bike Longwood Medical, Northeastern, Back Bay and beyond. Jamaica Pond and the hip Hyde Square neighborhood with Whole Foods and various restaurants, cafes and bars is only a 5-10 minute walk away. Onsite laundry. Gorgeous townhouse in a Victorian Brick Bowfront offers a unique blend of period details and modern conveniences. The era and character are cherished and showcased by triple layer crown moldings, three elegant marble fireplaces (two are decorative), soaring ceilings, rich paint colors, and chandeliers. The updated kitchen features stainless steel appliances, quartz countertops, and a convenient pass through to the dining room. A spiral staircase leads up to the master bedroom with a lovely window seat and a large dressing room that is currently being used as an office. The second bedroom is anchored by an exposed brick wall and offers generous closet space. There is also an updated full bathroom and a laundry closet on the second level. Other notable features include recessed lighting, gleaming wood floors, 2017 water heater, and 2010 roof, easy access to Longwood Medical by bus or downtown Boston in 10 minutes by T. Very close to Green Street station (Orange Line). Listed by Stephen Lussier, Arborview Realty Inc.